This site is long overdue for maintenance and is currently published for archival reasons only. It was intended to be a resource for anyone interested in Deaf Art, particularly the category defined by Deaf View/Image Art (De'VIA). 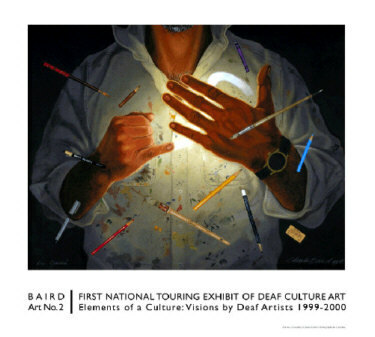 The site's chief purpose was the provision of information about the National Touring Exhibit of Deaf Culture Art that visited seven American cities between 1999 and 2001. Click here for exhibit information. Proceeds from sales of the poster and the exhibit catalog were a significant source of funding for this exhibit. Sales have been suspended pending an inventory of what remains. When this inventory is complete, final sale information will be posted here. Thank you for your patience! Click here to view the color images of artworks referenced in the Conference Proceedings for Deaf Studies VI: Making the Connection.